To enable educators to configure the Bridges Intervention materials to fit their local needs, schools and districts may purchase additional materials without teachers guides. Program components—game boards, spinners, and card decks—can be purchased by volume. Additional manipulatives are available as complete kits for Set 1 and Set 2 or can be purchased individually as needed. The five volumes comprising Bridges Intervention Set 2 address critical numeracy and computation skills at levels generally associated with third through fifth grade. Learn more about Bridges Intervention. Add additional capacity to Bridges Intervention Set 2 Volume 5 by purchasing extra components (game boards, decks of cards, spinners, etc.). Included are the same components that are specific to Volume 5 of Bridges Intervention, giving your school the ability to use Volume 5 with up to six additional students at a time. See the Components and Manipulatives sections on this page for information on included and not included materials. Purchases are limited to schools and districts that have purchased, or are purchasing, Bridges Intervention Set 2, and are subject to verification. Add additional capacity to Bridges Intervention Set 2 Volume 6 by purchasing extra components (game boards, decks of cards, spinners, etc.). Included are the same components that are specific to Volume 6 of Bridges Intervention, giving your school the ability to use Volume 6 with up to six additional students at a time. See the Components and Manipulatives sections on this page for information on included and not included materials. Add additional capacity to Bridges Intervention Set 2 Volume 7 by purchasing extra components (game boards, decks of cards, spinners, etc.). Included are the same components that are specific to Volume 7 of Bridges Intervention, giving your school the ability to use Volume 7 with up to six additional students at a time. See the Components and Manipulatives sections on this page for information on included and not included materials. Add additional capacity to Bridges Intervention Set 2 Volume 8 by purchasing extra components (game boards, decks of cards, spinners, etc.). Included are the same components that are specific to Volume 8 of Bridges Intervention, giving your school the ability to use Volume 8 with up to six additional students at a time. See the Components and Manipulatives sections on this page for information on included and not included materials. Add additional capacity to Bridges Intervention Set 2 Volume 9 by purchasing extra components (game boards, decks of cards, spinners, etc.). 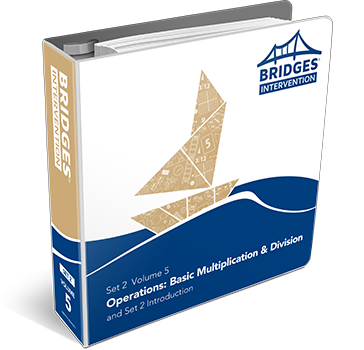 Included are the same components that are specific to Volume 9 of Bridges Intervention, giving your school the ability to use Volume 9 with up to six additional students at a time. See the Components and Manipulatives sections on this page for information on included and not included materials. Add additional capacity to Bridges Intervention Set 2 by purchasing extra manipulatives. Included are the same manipulatives contained in Set 2, giving your school the ability to use two of the same Set 2 volumes concurrently. See the Materials and Components sections on this page for information on included and not included materials. Purchases are limited to schools and districts that have purchased, or are purchasing, Bridges Intervention Set 2. Purchases are subject to verification.